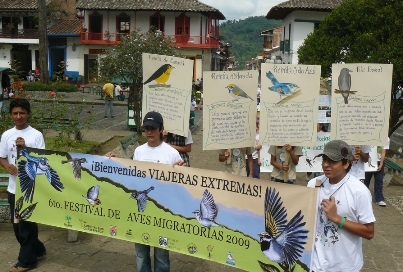 The National Programme for the Monitoring and Preservation of Migratory Birds is a ProAves Foundation initiative carried out with the cooperation of Preservation International so as to monitor and preserve endangered neotropical migrant birds with the help of the 27 monitoring stations existing in Colombia. This programme seeks to consolidate a strategic network for bird monitoring, to raise awareness of the importance of preserving these species and their natural habitats in Colombia and to increase the national capacity to undertake studies and preservation actions regarding migratory birds and their habitats. 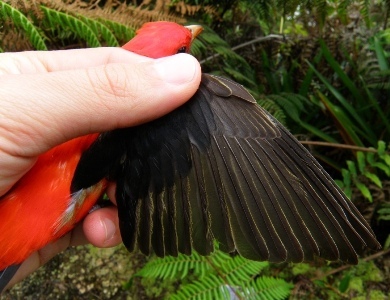 · First protected area for the preservation of migratory birds in Latin America. Establishment and expansion of the Reinita Cielo Azul Bird Reserve. 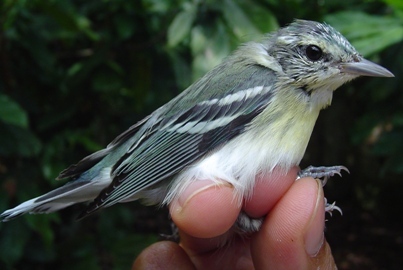 The protected area includes oak and shadowy coffee forests, ideal habitat for the main species of the reserve, the Cerulean Warbler (Dendroica cerulea). · Pauxi pauxi Bird Reserve. 1347 hectares to protect the species Cerulean Warbler in the Hill la Paz (department of Santander), main winter residence area for this species. It also protects nine endangered species. · Bird Information System online.A database with 260,000 entries of data resulting from the monitoring process and that follow national and international standards so as to facilitate the exchanges of information. MySQL on-line platform. There is a record of about 57% of the total number of birds, 75% of land migratory birds, 64% of the endemic birds and near-endemic and 44% of threatened birds in Colombia (54% critically endangered, 48% endangered and 40% vulnerable). a) 10 protected areas administered by the ProAves Foundation. 1 protected area administered in partnership with the CNCSR . Five Reserves established in 2006 and three in 2005.
b) 1347 ha of the Pauxi pauxi Bird Reserve in Betulia, Santander. 2006.
c) 1 hectare Chincherry Bird Reserve. San Andres Island, Archipelago. d) 100 acres Orejiamarillo Parrot Bird Reserve. Jardín, Antioquia. e) 529 acres El Dorado Bird Reserve.Sierra Nevada de Santa Marta. February 2006.
f) 220 acres Reinita Cielo Azul Bird Reserve, San Vicente de Chucuri, Santander. g) 1100 hectare Mirabilis-Swarovski Bird Reserve. Munchique, Cauca.July 2005. Ecological Restoration. Creation of nurseries in the Orejiamarillo Parrot Bird Reserve with an annual production of 10,000 young plant productions. Project for forestry and grazing techniques implemented in the Reserves of the Civil Society. Implementation of the work plan for the ecologic easement in Antioquia, 2005. Preservation Coffee plantation for the Cerulean Warbler. Marketing and sales by the American Bird Conservancy of the specialty coffee Cerulean Warbler. Strengthening institutional capacity. Meetings on protected areas, annual plannings and Ecoguide courses. · Consolidation of a strategic network for bird monitoring. 27 banding stations in operation since November 2003 spread throughout four of the five regions of Colombia: Andean, Caribbean, Pacific and Amazonia.199 people linked to the program, 37 banders, 105 field assistants and 57 local volunteers. ·Strategic alliances. Banding Seabirds and university banding groups. · First bird observatory in San Andres Island, Colombia. Currently under construction. Strengthening of a Banding system in Colombia. Construction of the foundations for the implementation of a national banding system. 12.355 banding historical data collected, 9000 bands distributed to 31 projects belonging to 22 organizations or individuals. Existing Website for Banding. 1.National and International acknowledgement as an organization that offers regular ornithology courses at different levels. 2. Training of skilled people in banding. a) Coordination in the Western Hemisphere of the Banding Network. b) Initiative of the Western Hemisphere for Migratory Bird Species. Cerulean Group. 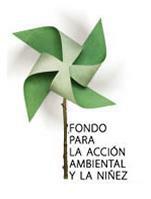 Participation and support of the activities of the group Cerúleo. Support for the postulation of the Cerulean Warbler in the list of threatened species of the United States. Alianza Alas Doradas. Coordination of the research and preservation working group for the Reinita Alidorada in non-reproductive areas. PriorityP Migratory AverAves Priority. Participation and support of the initiative Migratory AverAves Priority led by Cornell Laboratory. Mobile Environmental Classroom. The Mobile Environmental Classroom has travelled more than 30,000 miles rising ecological awareness in 46,206 people from 36 different municipalities belonging to 7 departments. There has been a very high participation of children between the age of 7 and 12 years. This age group has represented 67% of the individuals sensitized thanks to the Mobile Environmental Classroom. Migratory Bird Festival 2006 outstretched to Ecuador and Peru. Environmental Bird-Friendly groups. 3785 children and youth belonging to different environmental Bird-Friendly groups based in 5 departments and 7 municipalities. 46 Bird-Friendly schools belonging to 8 municipalities in 6 departments. 43 youth-related social services dealing with environmental issues in bird conservation. Implementation of Bird-Friendly Schools in the municipalities of Génova, Quindío and Roncesvalles and Tolima. a) Website with information and interactive games especially designed for Bird-Friendly children. b) Educational materials: posters, stickers, bookmarks, shirts and caps related to the events that deal with environmental education. Second version of the Migratory Bird Didactic Book, Extreme Travellers, 2000 copies printed. c) Media. High diffusion of environmental education events in the local and regional media. d) Conferences, symposia, meetings, seminars.Participation in 8 international congresses, 3 national congresses and 4 regional.